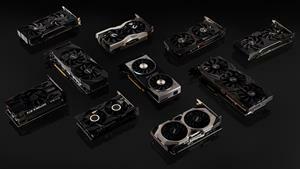 LAS VEGAS, Jan. 06, 2019 (GLOBE NEWSWIRE) -- CES -- NVIDIA today announced the NVIDIA® GeForce® RTX 2060, putting revolutionary Turing architecture GPUs within the reach of tens of millions PC gamers worldwide. The NVIDIA GeForce RTX 2060 GPU puts the revolutionary Turing architecture within the reach of tens of millions PC gamers worldwide, delivering exceptional performance on modern games, and priced at $349. (1) In a comparison across 23 benchmarks and games at 2560x1440 resolution, the RTX 2060 on average is 60 percent faster than the original GTX 1060. Tests included but are not limited to: Ashes of the Singularity , Battlefield V , Deus Ex: Mankind , The Division , Doom , Fallout 4 , Far Cry 5 , Ghost Recon: Wildlands , Hitman 2 , Hitman Pro , Middle-Earth: Shadow of War , PUBG , Rise of the Tomb Raider , Shadow of the Tomb Raider , Sniper Elite 4 , Strange Brigade , VRMark , The Witcher 3: Wild Hunt , Wolfenstein II and Unigine Superposition .